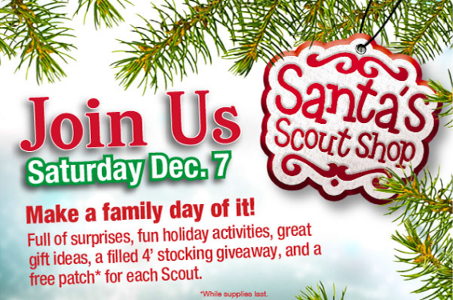 On Saturday, December 7th the Cabarrus Scout Shop will be hosting Santa’s Scout Shop. Come out and join in the Christmas spirit with refreshments, holiday gift ideas, and a stocking door prize giveaway! Our 4 ft. Christmas stocking contains items for Cub Scouting like a sleeping bag, lunch box, folding chair, school bag, canteen, and an educational kit called “Digging up Dinosaurs T-Rex”. Boy Scout items can be substituted if a boy scout’s name is drawn. This is over $100.00 worth of items! Also scouts can receive a special free patch!